If your chapped mouth wasn't any indication, many cereals aren't exactly good for you. Packed with added sugar, GMOs, hydrogenated oils, and more, starting off your morning with a bowl of cereal is basically like eating an artificially enhanced dessert for breakfast. That said, some cereals are definitely worse than others—namely, the ones we grew up eating in the '80s and '90s. While new FDA regulations and editorial exposés have shed a much-needed light on the true nutritional content of these kid-oriented products, many unhealthy cereals still sit on our supermarket shelves. The top offender on Mamavation's list, Kellogg's Froot Loops are chock-full of GMOs, hydrogenated or partially hydrogenated vegetable oils, modified food starch, artificial dyes, 10 grams of sugar per serving, and more. Unfortunately, Toucan Sam has been a successful marketing tool for Kellogg's, making Froot Loops a kid fan favorite since the '90s. The fact that this cereal has processed marshmallows in it is your first clue that it isn't a suitable breakfast food (or even a dessert). Packed with corn syrup, dextrose, modified corn starch, trisodium phosphate, artificial dyes, and another 10 grams of sugar per 3/4 cup, Lucky Charms contain almost as much sugar as a twin-wrapped package of Peanut Butter Twix. Speaking of cereals that cut up the roof of your mouth, Cap'N Crunch original and Cap'N Crunch Crunch Berries are two of the most unhealthy cereals you could possibly eat. 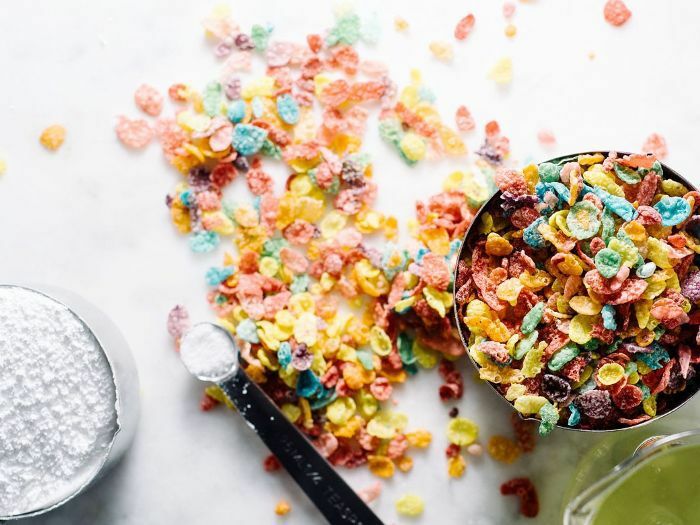 With 11 grams of sugar per serving (15 grams in the limited-edition "All Berries" version), plus GMOs, artificial dyes, BHT, and more, these sharp cereal bits can wreak serious havoc on your gums and give you a major sugar rush first thing in the morning. Head over to Mamavation for the full list of toxic cereals to avoid, and shop our healthy breakfast alternatives here.